I am the youngest child in my family (by 11 years). When I was a little girl my older brother (who was high school at this time) hadn't been very good that year. I don't even remember now exactly what he had done, but that's irrelevant. My parents repeatedly warned him that Santa would fill his stocking with clothespins if he didn't straighten up. Hearing this as a the six year old I was seemed HORRIBLE to me. Surely, such a thing wouldn't happen. Christmas morning arrived and my brother only received CLOTHESPINS in his stocking. I remember being horrified and actually shedding tears for my brother. My brother, however, in his very witty way (that he still has to this day), let out shrieks of JOY! (Yes, joy.) He immediately ran to his room, rigged up a makeshift clothes line and began hanging all of his socks and underwear with the clothespins, declaring they were the "BEST PRESENT EVER." Oh my. I will never ever forget that day. It is a story that gets told in my family over and over this time of year. When I look back on this story I realize that even at a young age my brother was MAKING THE MOST of what he had been given (well, maybe he was sticking it to my parents; err.... Santa, too! ), approaching his circumstances with a sense of humor, and protecting my feelings. 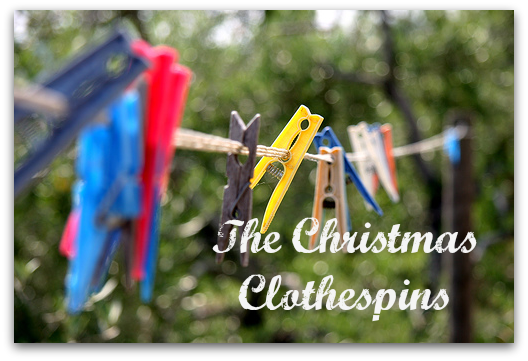 I laugh when I think about it, but the older I get, the more I see the beauty in those Christmas Clothespins. I do believe that my parents gave my brother some real presents that year, but I also think they were gently trying to prove a point to him. They knew they had little eyes watching... then again, so did my brother. Well, today I actually think I can help you get some pretty good presents. And no, they aren't clothespins! The iHomeschool Network wants to kick off the Christmas season with an ENORMOUS Stocking Stuffer giveaway. We are offering a chance for you to win many goodies! Wouldn't you like to win $250 CASH? We're giving away TWO of those prizes. The Rafflecopter below is self explanatory. One note: you only need to leave ONE comment on any one of the many participating blogs. Now, you have the opportunity to earn many other entries, too. The more Rafflecopter tasks you complete, the greater your chances of winning. Plus, you might just find some blogs you've never known about before; then it's an extra blessing. Good luck, and many blessings to you as you embark on a most joyous season of celebrating Christ's birth!